(UPTOWN CHARLOTTE, NC) -- Earlier today at BB&T Ballpark, Charlotte Knights Chief Operating Officer Dan Rajkowski announced long-time partner Sunbelt Rentals as the presenting sponsor of the 2019 Collegiate Baseball Series at BB&T Ballpark. In all, this year's series will consist of eight games at the home of the Knights -- the most in the ballpark's history. 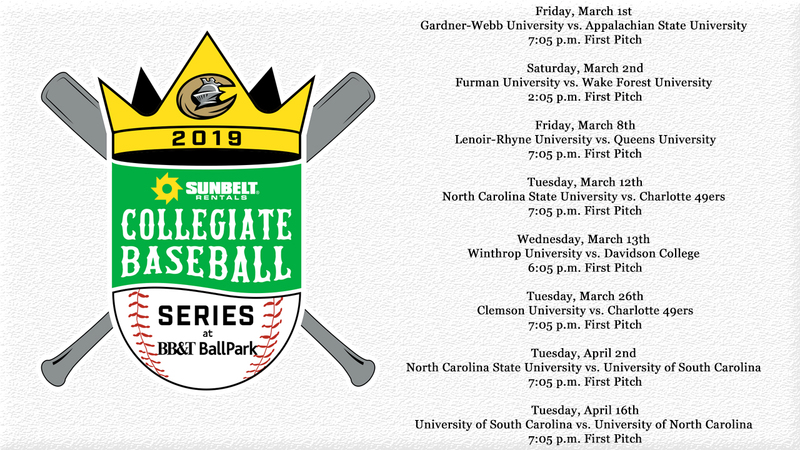 The 2019 Sunbelt Rentals Collegiate Baseball Series officially kicks off on Friday, March 1st with Appalachian State University hosting Gardner-Webb University at 7:05 p.m.
"As a long-time partner of the Charlotte Knights, we are proud to support the Collegiate Baseball Series," stated Bryan Gassler, Director of Marketing at Sunbelt Rentals. "These competitive events are exciting to be a part of, and we're looking forward to welcoming the college teams and their fans to our beloved City of Charlotte." Representatives from Sunbelt Rentals (Kim Brown and Randi Simpson), along with head baseball coaches from the Charlotte 49ers (Loren Hibbs), Queens University (Jack McDowell), Davidson College (Rucker Taylor), and Winthrop University (Tom Riginos), were all hand for Thursday's media session at BB&T Ballpark in preparation of the upcoming series. Tickets for all games in the 2019 Sunbelt Rentals Collegiate Baseball Series will go on sale to the general public beginning at 10:00 a.m. on Saturday, February 9th at the BB&T Ballpark ticket office in Uptown Charlotte. Online ticket sales begin at 12:00 PM that day at CharlotteKnights.com. The ticket office will be open until 2:00 p.m. on February 9th. Field Box tickets for select games start as low as just $10. Fans can also purchase an eight-game plan for just $80.